Here, we are taking you on an action-packed tour that will leave you in awe of Budapest’s architectural magnificence and magnitude. Particularly noteworthy is the architecture of the late 19th and early 20th centuries, when Hungary had finally found peace and prosperity. START: Take the M1 Millennium Underground to Hősök tere. 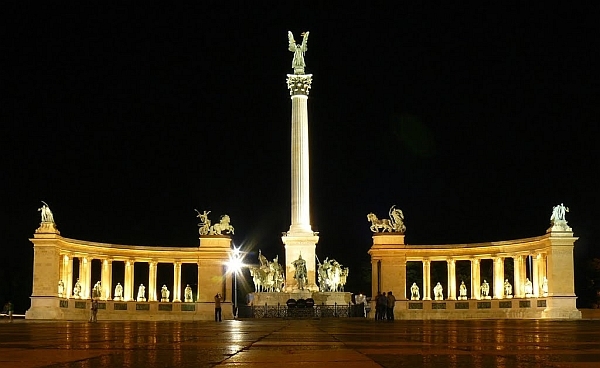 There’s no better place to start getting your head around the turbulent history of Hungary than Heroes Square. The key protagonists are strikingly introduced as a series of imposing statues. The central column is guarded by the seven Magyar tribe leaders who, in 896AD, stormed into the Carpathian basin, comprising present day Hungary and beyond. A statue of Árpád leads these seven heathen horsemen, and they appear to be kept in check by Archangel Gabriel, who presides over them from the top of the central column. The founding fathers are flanked by heroes including Szent (Saint) István, who converted Hungary to Christianity on Christmas Day in the year 1000AD, and all-conquering Kings Béla IV and Mátyás Corvinus, as well as perennial thorns in Habsburg Austria’s side like Rákóczi and Kossuth. Built in 1896 to celebrate a millennium of Magyar presence, nowadays Heroes Square is a popular place with skateboarders and with rightwingers who use it as a backdrop for rallies. Location: Hősök tere at crossing of Andrássy út and Dózsa György út. Metro: M1 to Hősök tere. Take a ride on continental Europe’s oldest metro, which opened in 1896 to coincide with the 1,000th anniversary of Magyar presence in Hungary. Get on at the Hősök tere stop and be whisked, just under street level, directly down the elegant Andrássy út (boulevard) - which we recommend you walk down on Day 2. Get off at Oktogon to see one of Budapest’s several centers where Andrássy út meets the Nagy körút (the Great Boulevard), or stay on one more stop to Opera. After London’s underground system, this is the next oldest in the world and the stations in particular retain the fin-de-siecle feel. Location: Entrance at end of Andrássy út at crossing of Andrássy út and Dózsa György út; on righthand side of Andrássy út if looking from Heroes Square. First metro 4:36am, last 11:20pm. 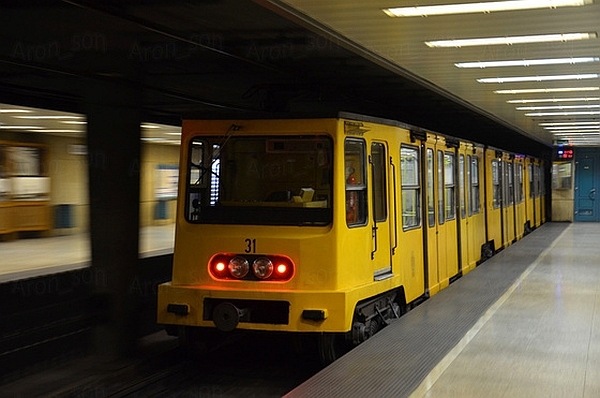 Read this post about public transportation in Budapest. The Miklós Ybl-designed Opera House provides the sumptuous veneer to classy Andrássy út. If you can, we suggest you look now but come back and experience the Opera House in all its glory by catching a performance. Be warned that the supersteep cheap seats are not for sufferers of vertigo. 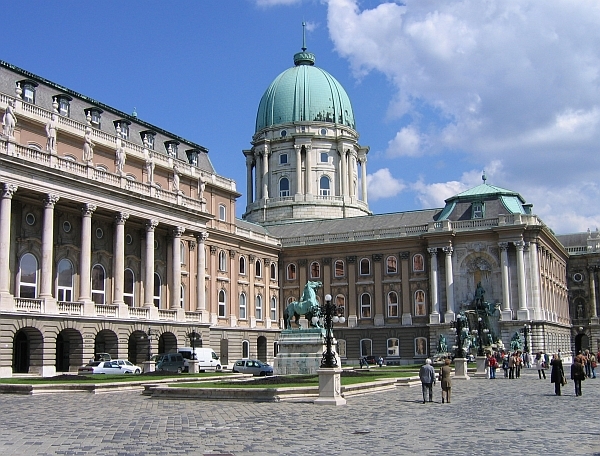 The neo-Renaissance style of the exterior is all semi-circular arches and columns, and is symmetrically topped off by statues of idols of Hungarian opera, while statues of the two Hungarian musical greats, Liszt and Bartok, flank the main entrance. Step inside and the style changes dramatically to neo-classical with the walls and ceiling adorned by lavish works from leading Hungarian artists of the day, including Gyula Benczúr and Bertalan Székely. 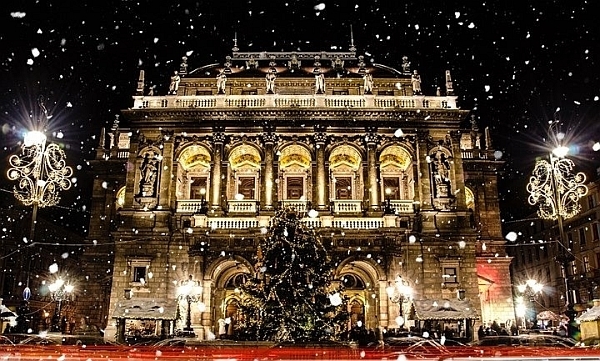 Exclusive Hungarian participation was deemed crucial in establishing the home of Hungarian opera, although the scary but magnificent-looking goldplated, three-tonne chandelier was imported from Germany. Time: 15 minutes, 45 minutes if you take the tour, but check ahead as tours may be cancelled due to rehearsals. Location: Budapest, Andrássy út 22. Building this Budapest landmark proved a job too far for defining Hungarian architects József Hild and Miklós Ybl, who both died during the prolonged 54-year construction. The Basilica project literally hit rock bottom when the dome collapsed in 1868, a year after Hild’s death. 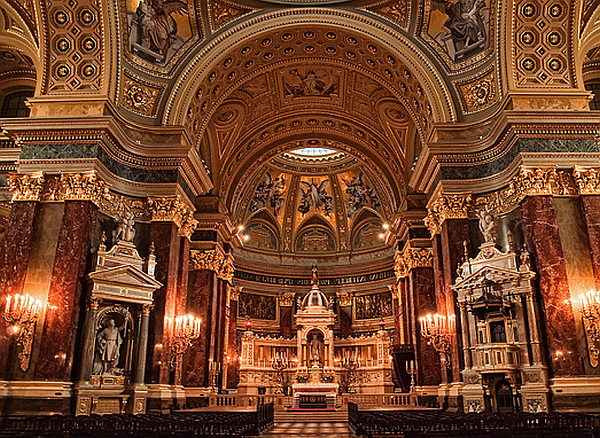 Architect József Kauser was called in and dragged Budapest’s biggest church over the finishing line in 1905. A massive restoration project was completed in 2003 and the gleaming marble is the result of the application of 200kg of beeswax. Mathematically minded Hungarians love dealing in numbers and, like the Parliament’s dome, Szent István’s stands 96m/315ft high, as a tribute to the Magyar settlement of Hungary in 896. Had they arrived a few years earlier, perhaps the roof wouldn’t have fallen in! The almost 1,000-year-old withered hand of St. Stephen, Hungary’s first King, is displayed in the Szent Jobb Chapel. Another great Hungarian hero Ferenc Puskás, the talisman of the Magical Magyars and Real Madrid goal machine, was laid to rest here in 2006. 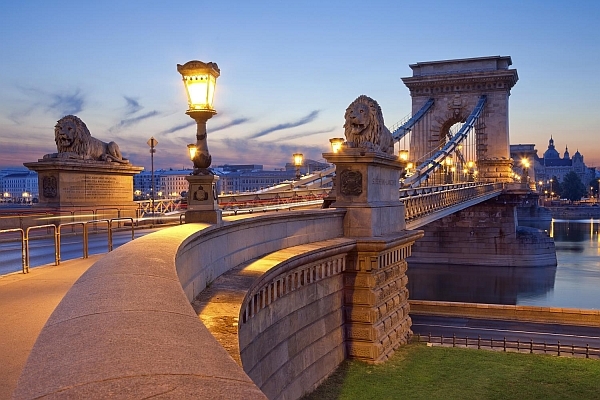 An elevator is on hand to whisk you up to near the top for sweeping views of Buda and Pest. Time: 60 minutes. Opening hours: Mon–Fri 9am–5pm, Sat–Sun 10am–4pm. Location: Budapest, Szent István tér 33. Metro: M1 to Bajcsy- Zsilinszky út. M3 to Arany János utca. Architect Imre Steindl’s mostly neo-Gothic extravaganza dominates Pest’s waterfront and bucks the Gothic trend with the 96m/315ft-high dome at its center. While it was once the biggest Parliament in the world when it opened for business in 1896, the building has lost none of its opulence. The exceedingly long corridors of power, the grandiose gold-plated interior and red-carpeted staircases do nothing to instill any form of collective unity between the polarized politicians. While much like any Parliament, should you happen to enter the chamber after a debate, to which the opposition actually shows up, you can almost feel the steam rising as you enter. Look out for the Hungarian crown, a gift from the Pope to King (now Saint) István (Stephen) in the year 1000 to thank him for signing up Hungary to Catholicism. Watch out for protestors outside calling for the current Prime Minister’s head. Time: 60 minutes for tour, 15 minutes viewing from outside. Enquire ahead via internet as Parliament is closed when in session & turn up 10 min before the tour begins. Buy tickets at gate X. English tours at 10am, 12am, and 2pm daily. Location: Budapest, Kossuth tér 1–3. Metro: M2 to Kossuth Lajos tér. This, the pick of Budapest’s varied bridges, isn’t just an architectural marvel but is the first permanent bridge that linked Buda with Pest, setting in motion their eventual unification. It’s also still the best and most scenic way of traversing the Danube to get from Parliament and Pest’s old town to the Castle District. The brainchild of István Széchenyi, an anglophile Hungarian Count who sought to bring rural Hungary into the modern age, he employed two designers to build the ornate bridge, each with the name of Clark: William, an Englishman, and Adam, a Scot. The Chain Bridge opened in 1849, during Hungary’s War of Independence with Austria and fortunately survived an immediate botched attempt to blow it up, something that the more efficient Germans managed when retreating from occupying the city in 1945. It was soon rebuilt and reopened on its centenary in the original style. Come back at night when it and the Royal Palace are both lit up dramatically. Location: Connects Széchenyi István tér with Clark Adám tér. Bus 16/105 or Tram 2. 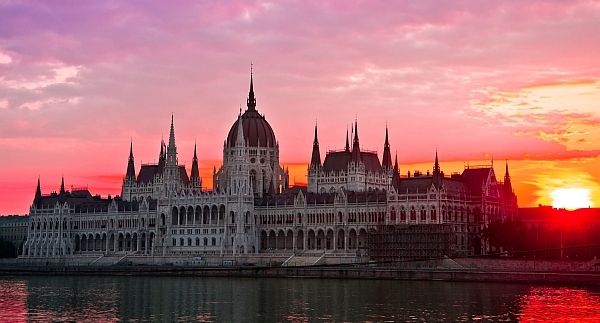 Bombed, burnt, battered, and rebuilt many times throughout the centuries, the Royal Palace and St. Matthias Church dramatically portray Hungary’s trials and tribulations. We suggest you wander the district at your leisure to soak up the history of the place and return later for a more in-depth tour. Location: Castle District, take the Bus No. 16 to Dísz tér.